What sets us apart? Our amenities and service. Every room has an en suite bathroom. Our bathrooms all include; shampoo/conditioner, lotion, Hypo allergenic glycerin and non-glycerin soap, make-up remover, bath salts (for rooms with tubs), Hair dryer, and plush towels, as well as extra towels for outdoor use. Irons and ironing boards are available by request. All of our beds have tempurpedic bed toppers, down comforters, high thread count cotton sheets, and plush towels. Non-down alternatives are available upon request for those with allergies. Extra pillows or softer/harder pillows are also available by request. Breakfast may be one of the highlights of your stay here. Every morning you'll enjoy a different freshly prepared and filling meal. We use fresh and local ingredients, organic produce, and fresh organic eggs from our resident hens. "Breakfasts were so delicious that I could have easily been talked into staying a day or two longer just to see what would be served next." Trip Advisor review Dec '14. 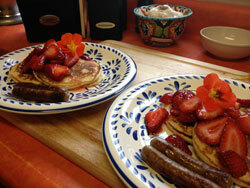 If you don't feel like coming down to breakfast, we'll bring it to you! Room service is available for a nominal charge. Every afternoon we serve fresh baked sweets (cookies, cupcakes, lemon bars etc. ), available in our common room. We have several dozen types of tea, decaf and regular coffee, hot chocolate, and hot or cold water available 24hours a day for our guests. Unplug for a day or two - you'll be surprised how good it feels! We do not have TV's in our rooms. There are many reasons for this, but the main reason is that it preserves this 1890's residence as a quiet retreat. Enjoy a romantic evening with your sweetheart, get some much needed rest, play a game of cards, chess, or monopoly, and do it in peace. You won't be listening to your neighbors TV late into the night at this B&B. And, if you absolutely can't leave the hustle and bustle of the modern world for a day or two, we have fast and dependable Wifi available. There are also several bars, including North Coast Brewing Company, within walking distance that show your favorite sporting events. 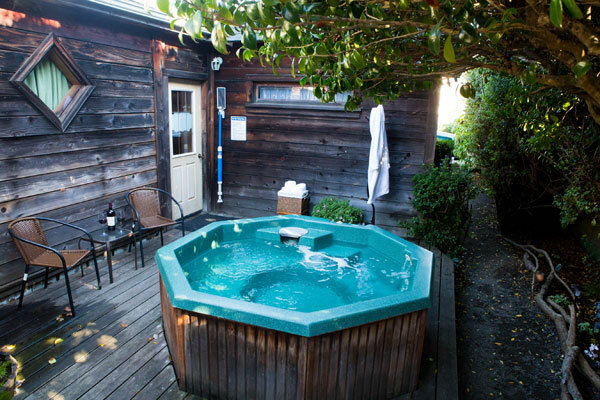 Our Hot tub is so private you may feel like it's your own private oasis. It's available 9am-10pm every day of the year, rain or shine. In the evening you'll enjoy a romantic glow as it is lit by solar LED lights in the camellia trees and along the eves. The Country Inn is close to everything! North Coast Brewing Company is just a block and a half south on main street. Just past that, the entire down awaits - shops, restaurants, the Guest House Museum, Tattoo Museum, and art galleries. 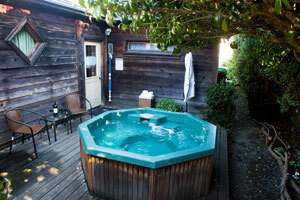 We are also just a few minutes' walk from the famous Glass Beach, and the new Coastal Trail. McKerricur State Park and Russian Gulch State Park and the Point Cabrillo Light House are also close by and are guest favorites. Other nearby activities include; hiking, bicycle rental, horseback riding, photography, fishing, crabbing, whale watching, abalone diving, the Mendocino Coast Botanical Gardens, the Redwoods and the Drive-thru Tree.